Just left London Bridge and it's dry as a bone. Thanks for this. I'm using this I found on google..
Hope you're not expecting snow! Dewpoints are nowhere near good enough across the entire South East ranging from 2-3c.................But there are quite a few 0c and 1c Dp's to our North West over the Midlands and its this undercutting cold we need to head from the NW into our region as the precip moves through bringing that evaporative cooling into play. Thursday, most models don't show much if anything for tonight, always a chance it could pull a surprise like that trough that came through, but I think settled snow will be restricted to higher altitudes, probably 150M ish. Thanks buddy, thats the sort of report which is vital to areas further east. Enjoy that settling snow, should get a top up on Thursday as well. And the growing signs of High Pressure to our North East on the models gathers pace for the 2nd week of February as well. Yeah, I use that calculator. It's nearly always on the ball. 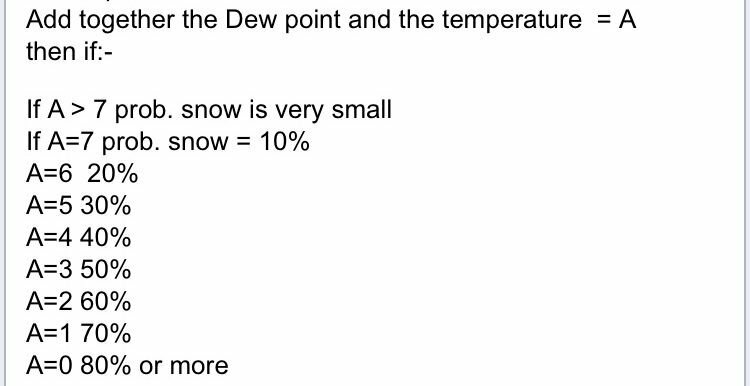 It works on the basis that snow will fall if the air temperature is within 1 degree of the melting temperature, of snow. All sounds promising I'd say.... especially with added 'oomph' from the night hours. 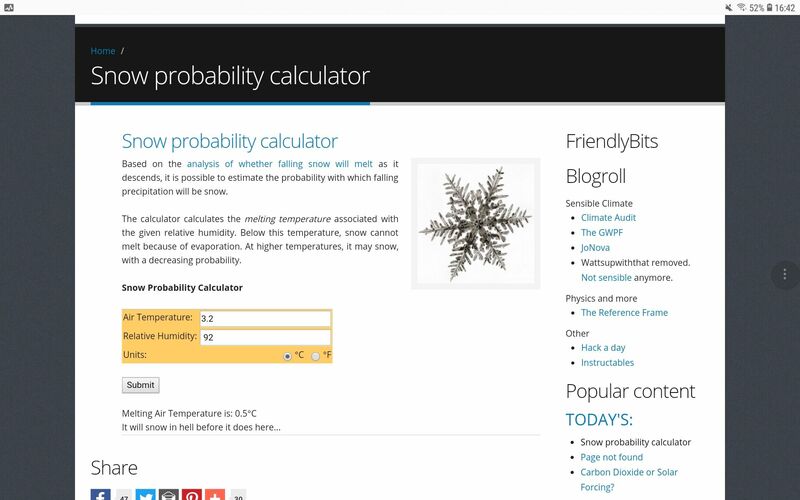 Currently it says "more likely to snow in hell." Need temp to drop, currently 4.4 but heading in the right direction. Yep, I had that throughout Monday evening when that trough was over us, at temps of 2c. Don't understand the negativity. The front will be over us for 4 or 5 hours near midnight, that is plenty of time for evaporative cooling to take hold. Looking at the radar and it seems to be fizzling out - not sure there will be much left on it. http://www.trafficengland.com/#map-menu-traffic-information - Useful if you want to see where the snow line is... enable the traffic cams and you can click away to your hearts content! Swindon looking pretty good, which seems to fit well with the current radar. Oh yes, that's quite heavy. Is Swindon at high elevation?